And we have a new winner for overall lowest in Wagamama calories. 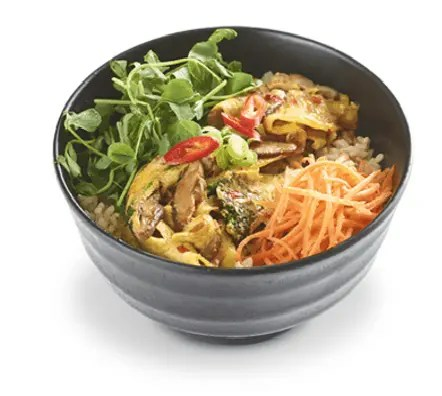 Like last year’s winner, it’s from the salad menu, but this year, at 342 calories, The Pad Thai Salad is the lowest calorie main meal you can order at Wagamama. Stand up and claim your prize oh joy filled mix of gingery chicken and prawns served with heaps of veggies. Despite the name there’s no noodles though; that truly would be impressive with so few calories! Now, I admit – the nutritional information doesn’t specify if this calorie count includes the serving of chopped peanuts that comes on the side so just be wary of that. If the very idea of not knowing that makes you nervous, then last year’s winner, The Sirloin and Shiitake Salad will still fill you up for just 434 calories. But what if you don’t want a salad, well no problem… here’s the lowest calorie options for the other categories on the menu. Omakase means dishes chosen by the chef in Japanese which is why on the menu there doesn’t seem to be a common theme for these dishes – and that is also reflected by the calories. Boy do they vary, in fact, the lowest calorie dish contains less than half the calories of the highest (which is the Sticky Pork Belly at 1394). 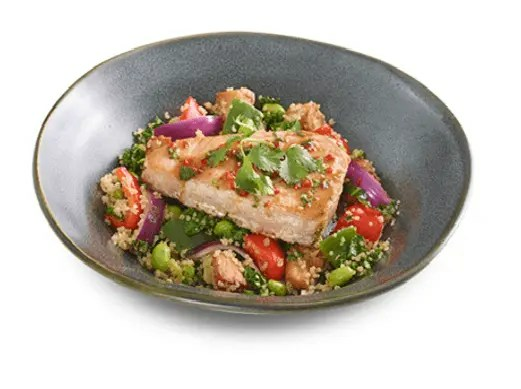 So what is the lowest dish?….It’s the Seared Nuoc Cham Tuna, a mix of seared tuna, sweet potato, kale and quinoa that sounds super healthy and contains just 522 calories. A few of the Ramen soups in Wagamama are under 600 calories – including the Chilli Chicken and the Yasai versions, but the lowest calorie option is the simple Chicken Ramen which contains just 476 per steaming hot soup filled bowl – it’s a good choice if you’re having a noodle craving as it’s also the lowest calorie dish containing noodles on the menu. Teppanyaki dishes are coked on an iron griddle which gives them that smoky taste – it’s that taste that’s the reason that every time I go to Wagamama I order the Yaki Soba. Thankfully, it’s actually not too evil at 715 calories, but if you’re willing to forgo the meat you’ll save a few extra calories by ordering the veggie version – Yasai Yaki Soba – which comes in at just 696 – and wins the prize of lowest calorie offering on this part of the menu. If you’re ordering donburi then chances are you’re in a ricey frame of mind – as donburi means rice bowl in Japanese. For this category, your lowest calorie option is the Shiitake Donburi – which doesn’t just contain mushrooms, but instead is a mushroom and broccoli omelette on a bed of rice. It sounds very filling for its 713 calories. Most of the curries at Wagamama clock in at over 1000 calories each – the exception are those in the Itame range, which again, proves my point of why it’s so important that companies give us this information – the itame range are based on coconut which if you couldn’t look things up might lead to believe they wouldn’t be a great thing to order, but in fact, the maximum calories in the itame curry range is the 820 in the chicken version. Your lowest choice though is the Prawn Itame at 718 calories. So that’s it – the 2017 update of Wagamama calories and the best choices you can make. Go, enjoy, eat until your little belly is full.Sadly, there’s no Wagamama here in Australia any more but we do have some amazing independent Asian restaurants so I’m not feeling deprived. My absolute favourite is a place called Happy Chef at the Sussex Street Food Court in Chinatown – their laksas are amazing. Sadly, I’m not sure they have a list of calorie counts! If you’re a Wagamama fan or love any of the other Asian chain restaurants, here’s a four brilliant recipe books to take a look at – use the recipes as a starting point and you might be able to tweak the calories in your favourites even further by cutting the quantities of carbs or using slightly less oil than suggested. Personally, I’m a big fan of the ITSU one. Simply click the pics and you’ll go straight to the amazon page where you can buy the book or just find out more about it.